Prince Ernest, Duke of Cumberland and King of Hanover (5 June 1771 – 18 November 1851) was the the fifth son of George III and Queen Charlotte and a younger brother of George IV. 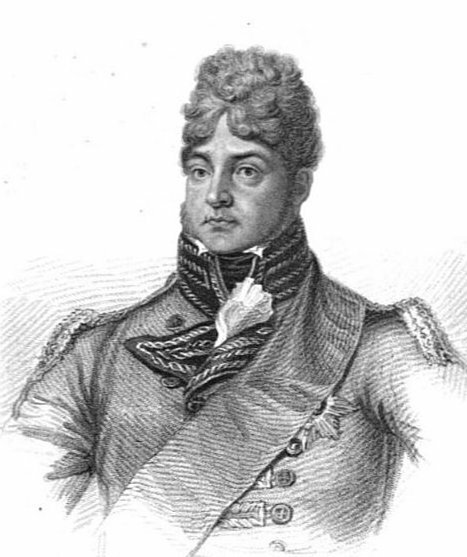 Prince Ernest Augustus was born at Buckingham House on 5 June 1771. Ernest grew up at Kew, housed with his younger brothers, Augustus and Adolphus. The three Princes were made Knights of the Garter on 2 June 1786 and shortly after, were sent to the University of Göttingen to study. Ernest was destined for a military career and entered the Hanoverian army in 1790 as a Lieutenant in the 9th Hanoverian Hussars. He saw fierce action against the French in Flanders and the Netherlands and on one occasion, was reported to have single-handedly carried a French officer from the battlefield as a prisoner of war. 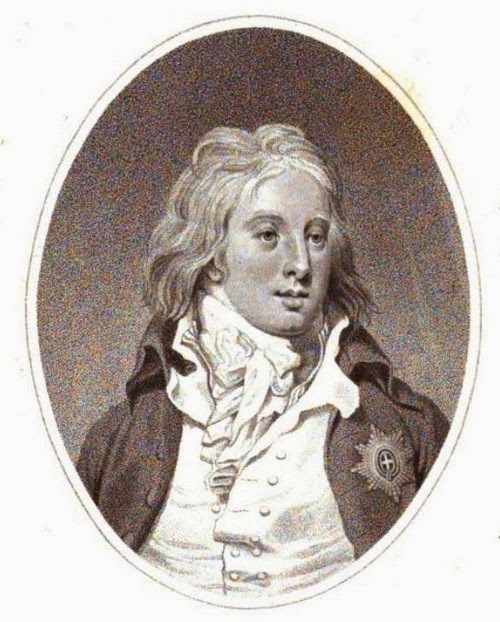 He was injured at the Battle of Tournai on 22 May 1794 and returned to England in 1796 with a permanently scarred face and the loss of sight in one eye. Although commended for fighting bravely, he had a reputation for treating his men harshly and, despite regular promotion and being gazetted Field Marshal in 1813, he never saw active service abroad again. On 23 April 1799, Ernest was made Duke of Cumberland and Teviotdale and Earl of Armagh and awarded a grant of £12000 a year by parliament. Ernest was a radical Tory, unwaveringly Protestant in outlook and an opponent of political reform. He was vehemently opposed to Catholic emancipation and when the Duke of Wellington found it expedient to support it, Ernest used his influence over George IV to persuade him against it. As a result of his interference, Wellington’s government resigned. But it was a short-lived victory. Ernest did not have enough backing to form a government of radical Tories. Wellington was recalled and the act was passed in 1829. Ernest was tall and elegant in person; whilst his brothers had a tendency to corpulence, he remained thin. He had handsome features, though one eye was disfigured in war and in later years he grew broad, drooping whiskers to mask his battle scars. In character, he was radical and outspoken. He was able to wield a great deal of influence over weaker minds, notably over his brother George IV, whom he pushed towards his own radical Tory policies. On 29 May 1815, Ernest married Princess Frederica of Solms-Braunfels in Neustrelitz, whom he had met and fallen in love with a few years previously. Princess Frederica was a niece of Queen Charlotte’s who had been married twice before – to Prince Louis of Prussia and to Prince Frederick of Solms-Braunfels – and twice widowed. 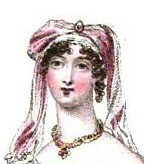 The marriage was solemnised again at Carlton House on 29 August 1815 but the Queen refused to receive the new Duchess. 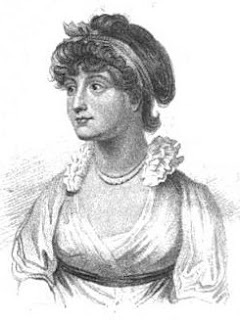 The Queen disapproved of Princess Frederica who had been unofficially engaged to marry the Duke of Cambridge in 1797 but had become pregnant by the Prince of Solms-Braunfels and married him instead. Ernest’s marriage was very unpopular and parliament refused to increase his allowance, forcing the couple to live abroad, largely in Berlin, where their son George was born on 27 May 1819. When William IV died on 20 June 1837, his niece Victoria became Queen of England. But she could not accede to the throne in Hanover which could only pass to the male line, and so Ernest became King of Hanover. He entered his capital on 28 June and proceeded to attack the liberal constitution. He ruled autocratically, but listened to reasonable complaints and avoided any hint of revolution. Ernest was a good king and well-respected in Hanover and he successfully ruled during a very unsettled period in Europe. 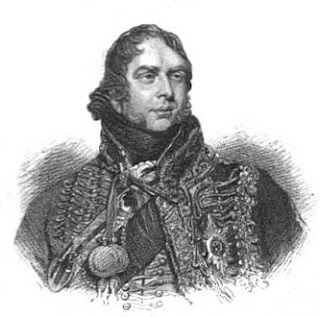 The Duke of Cumberland’s life was beset with scandal. On 31 May 1810, his valet was found dead and rumours circulated that he had murdered him, though the jury passed a verdict of suicide. In 1813, he was involved in a political controversy over a parliamentary election in Weymouth. He was accused of influencing the outcome in favour of the Tories, which was considered improper behaviour for a member of the House of Lords. 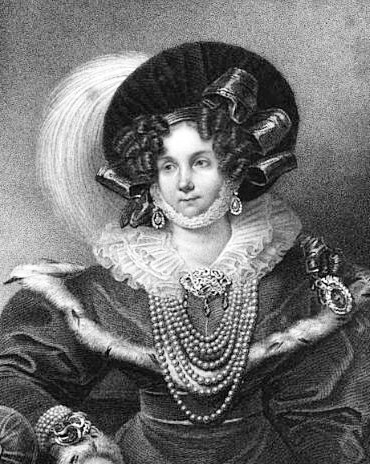 Years later, he wrangled with Queen Victoria over some jewels that he declared were his by right under Queen Charlotte’s will and which his niece refused to give up. 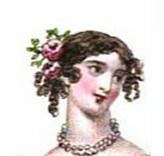 The bitter dialogue between the parties caused considerable embarrassment to the government and when Ernest visited England for three months in 1843, Queen Victoria showed her continued disapproval by only inviting him once to dinner. In 1829, Ernest created a scandal over Lady Lyndhurst who claimed that he had tried to assault her and, when she resisted, had threatened to ruin her and her husband. The following year, he faced another over Lady Graves. 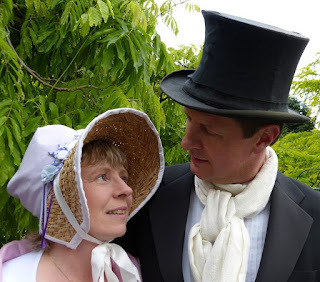 Rumours of a relationship between Ernest and Lady Graves reached the ears of her estranged husband. Lord Graves wrote a note declaring that he did not believe them, but nevertheless committed suicide. But the most serious scandal which confronted Ernest was in relation to his sister, Princess Sophia. His affection for her was judged by some to be unhealthily intense, and it gave rise to the rumour that he had fathered the illegitimate son she was said to have given birth to in 1800. 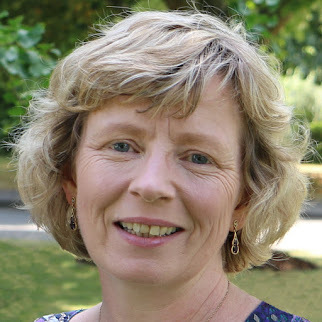 Although this was almost definitely untrue, there are comments in her letters which hint at the possibility that he had tried to assault her. Ernest outlived all his brothers but eventually died at Altes Palace in Hanover on 18 November 1851. He was succeeded in Hanover by his only son George, who had been blinded in an accident as a child. Ernest was buried on 26 November in the mausoleum at Herrenhausen, Hanover. Although despised in England, he was popular in Hanover and an equestrian statue was erected there in his memory, paid for by voluntary donations. 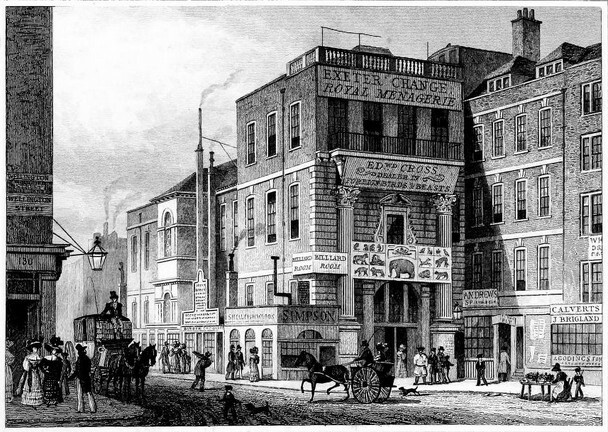 The Exeter Exchange, popularly known as the Exeter ‘Change (1), was on the north side of the Strand in London. It was built on the site of Exeter House, a residence of the Earls of Exeter, from which it acquired its name. The building was designed to be a superior shopping venue, with an arcade in front, and originally housed small shops with lodgings above, but over time, the ground floor was taken over by businesses. From about 1773, the upper floors took on a new role, housing a menagerie formed by Mr Pidcock. 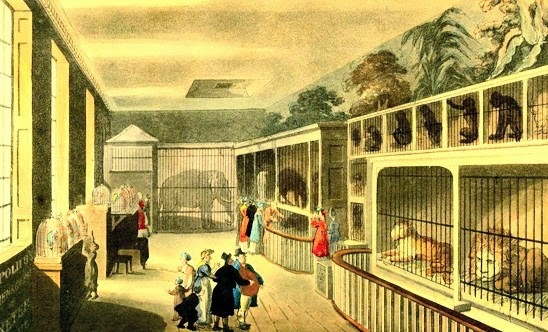 On Pidcock’s death in about 1810, the menagerie passed to Stephani Polito and on his death in 1814, one of his employees, Edward Cross, took over the menagerie. The menagerie displayed a wide variety of animals to the public in competition to the menagerie at the Tower of London. In 1812, the animals at the Exeter ‘Change included a Bengal tiger, a hyena, a lion, a jaguar, a sloth, a camel, monkeys, a hippopotamus, a rhinoceros, an elephant, an ostrich “said to weigh upwards of 200lbs and to be 11 feet high”, a cassowary, a pelican, “emews”, cranes, an eagle, cockatoos, elks, kangaroos and antelopes (2). The numerous parties of distinction that daily visit the Royal Menagerie, Exeter ‘Change, is a well-merited reward to its celebrated Proprietor, for his spirited and indefatigable exertions, in procuring, for the inspection of the public, those remarkable and rare living objects of the first celebrity in natural history, which no other capital in Europe can boast of. The formidable Rhinoceros, which is grown so prodigiously since his arrival in 1810, as to be considered one of the largest ever seen, even in India, is so extremely rare, that many gentlemen have taken long and extensive excursions in its native country, without ever having an opportunity to see that animal; and his history, in many respects, is but very imperfectly known. Where it inhabits it is a dread to the human race, as well as to all beasts of the forest, being in strength inferior to none, and so protected, by nature, with his coat of mail, as to be capable of resisting the attacks of any other animal, and even the force of a musket-ball: but, what is more wonderful, in the adjoining den, in the same apartment, there is a fine large Male Elephant (indisputably one of the finest specimens of its species ever brought from India, and adorned with long ivory tusks); those, the two most formidable enemies in nature, are so closely united, and so reconciled, as to suffer to take their food from each other. Chunee the elephant was the star attraction of the menagerie. After arriving in England in 1809, he performed on stage, delighting audiences “for forty successive nights at the Theatre Royal, Covent-Garden”(2) and was often paraded in the street outside the menagerie. But he was not a happy elephant and on 26 February 1826, he went out of control and killed one of his keepers in a fit of bad temper and was subsequently put down for safety reasons. After the death of Chunee, the popularity of the menagerie rapidly declined. 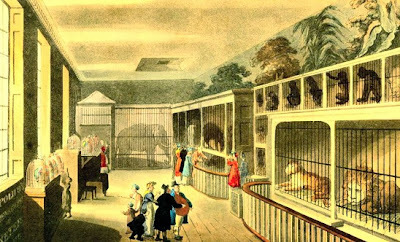 Cross started a new menagerie at the Surrey Zoological Gardens, and around 1829 the Exeter ‘Change was demolished. (1) Also known as the Exeter Change - the apostrophe is sometimes dropped. 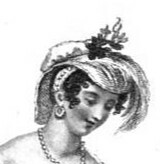 (2) From Ackermann’s Repository (Jul 1812). (3) There is some artistic licence in the print of the first floor of the Royal Menagerie, full details of which are given in the accompanying article in Ackermann's Repository. (4) From Life, Letters and Journals of Lord Byron (1839). 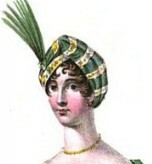 The pictures trace the changes in evening headdresses, from the modest turbans of the early Regency, through the penchant for veils and onto tall feather headdresses and the return of turbans, higher than before. The hairstyles move from neat, high twists with ringlets at the side to dishevelled curls, then styles combed into smoothness before going back to ringlets. 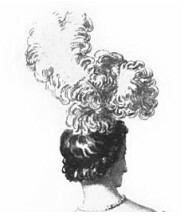 By the end of the Regency, hair is being elegantly arranged and ornamented. 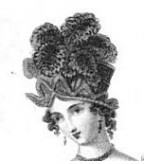 Throughout the Regency period, flowers are often used to decorate the hair when no headdress is worn.